Cuban pianist, bandleader, composer and arranger. Born October 9, 1941 in Quivicán, Cuba. Winner of four Grammy awards. 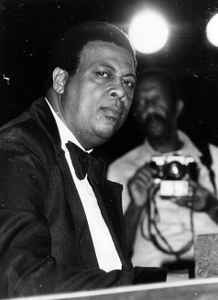 In 1972 he founded the group Irakere, one of Cuba's best-known Latin jazz bands. Together with pianist Gonzalo Rubalcaba, Valdés is revered as one of Cuba's greatest jazz pianists. His father is the famed Cuban pianist and former director of Havana's famous "Tropicana" night-club band Bebo Valdés. He has won five Grammy Award and three Latin Grammy Awards. Chucho has won four Grammy awards: in 1978 for the album Live at Newport by Irakere; in 1998 for his contribution to the CD Havana by his band Crisol (formed in 1997), with two songs - "Mr. Bruce" and "Mambo para Roy" - written by Chucho; in 2003 for his album Live at the Village Vanguard; and in 2011 for his album Chucho's Steps. On 16 October 2006, Chucho Valdés was nominated Goodwill Ambassador of the Food and Agriculture Organization of the United Nations (FAO).